Clean and contemporary, the Metropolitan Dining Table makes for the ultimate al fresco experience. The frame is brushed aluminum and the top is polyurethane simulated wood. The perfect place to serve up your favourite herbed pasta salads and frosty bottles of beer. This patio table is constructed using UV and weather resistant materials, making it easy for you to add serving space to your backyard. The table top resembles real wood but is engineered to resist discoloration. The adjustable base ensures that this table fits a wide range of layouts tailored to your specific needs. Designed to be maintenance free so you can focus on enjoying the outdoors with your friends and family. Home Styles Biscayne 42 inch Round Outdoor Dining Table is constructed of cast aluminum with a bronze finish. Features include a powder coat finish sealed with a clear coat to protect finish, attractively patterned table top has center opening to accommodate umbrellas, and nylon glides on all legs. Item Size: 42w 42d 30h. Stainless steel hardware. 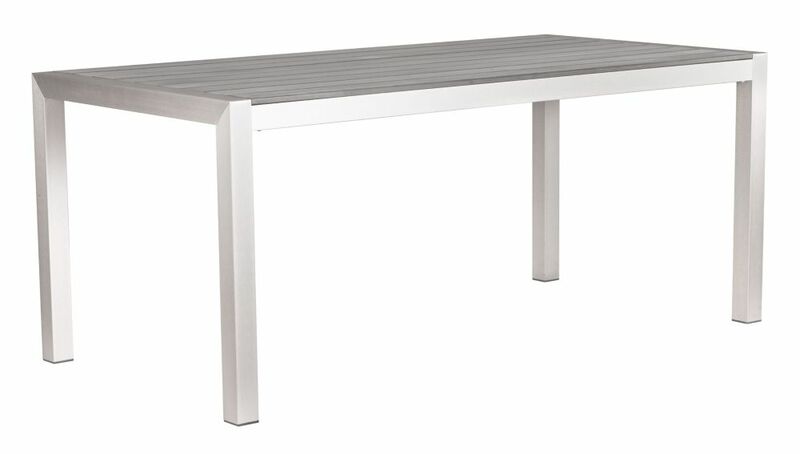 Metropolitan Patio Dining Table in Brushed Aluminum Clean and contemporary, the Metropolitan Dining Table makes for the ultimate al fresco experience. The frame is brushed aluminum and the top is polyurethane simulated wood. The perfect place to serve up your favourite herbed pasta salads and frosty bottles of beer.